« Do Voters Think Elizabeth May Should be Included in the Debate? 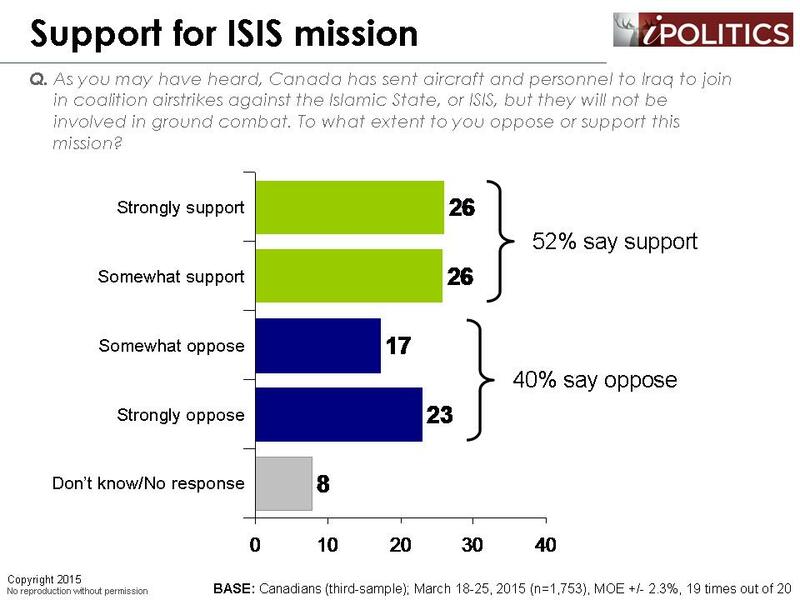 [Ottawa – March 26, 2015] The ISIS mission continues to receive majority support, but this support is beginning to soften and is increasingly divided across partisan leanings and other key fault lines. 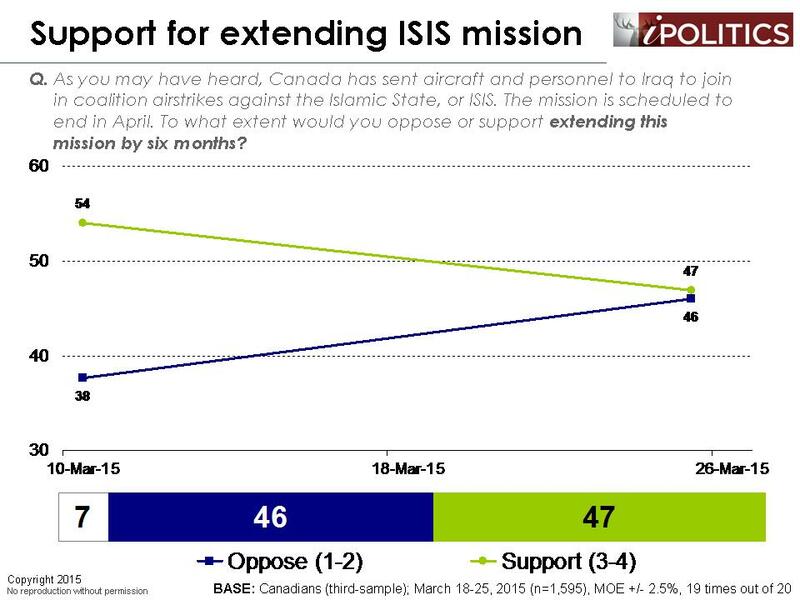 This pattern of waning public support is familiar and was seen in the case of the Afghanistan mission. The initial blend of moral outrage and emotional chauvinism linked to the serial barbaric atrocities of ISIS will be tempered by more rational appraisal of the pros and cons of the mission as time goes on. More pointedly, the question of extension of the mission, both in duration and possibly to something beyond an air mission, is a far more controversial proposition. 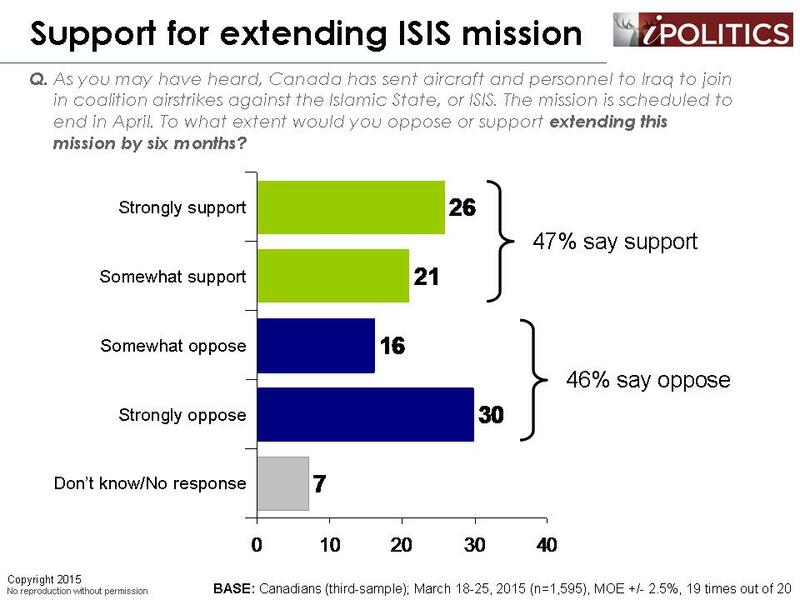 Support for the extension of the mission has dropped over the past two weeks as the debate has become more concrete. In a scrupulously neutral question, which we have repeated, the public are evenly divided on whether to extend the mission. There are very distinct groups such as women, Quebeckers, visible minorities, and non-Conservative supporters who are clearly offside with an extension of the mission. Given the trajectory of support for extending the mission, and historical patterns of eroding support for past missions, it is safe to say that we will probably see clear majority opposition to this pro forma extension in the near future. 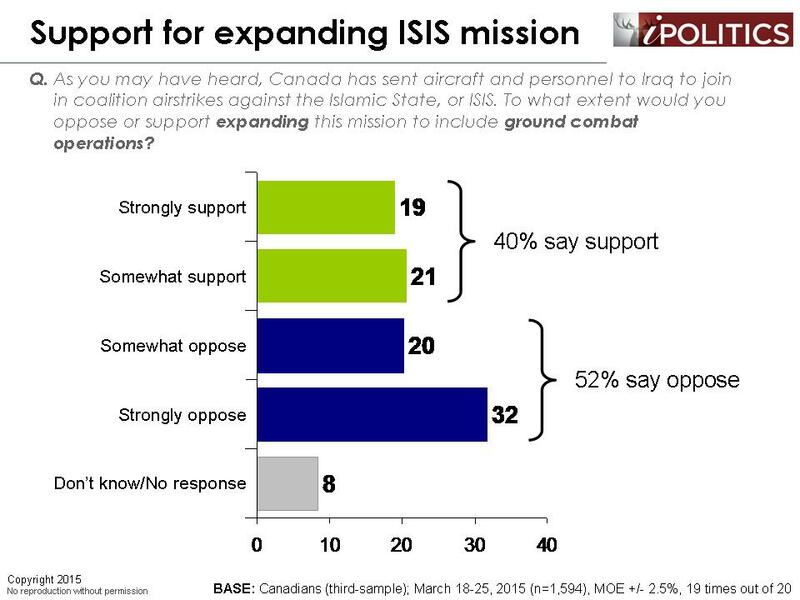 The question of whether the mission should be expanded to include ground and combat roles is basically a non-starter with most Canadians and finds little favour with anyone other than Conservative supporters. Given the dubious boundaries between combat activities and the current role, and that many experts believe that real success would entail ground and combat roles, it is clear that most Canadians want no part of this. How this will all play politically is hard to say. The boost that this has provided to Mr. Harper has been clear. With the ISIS mission, he has had a rare moment of accord with the Canadian public on a significant position not shared by opposition leaders. 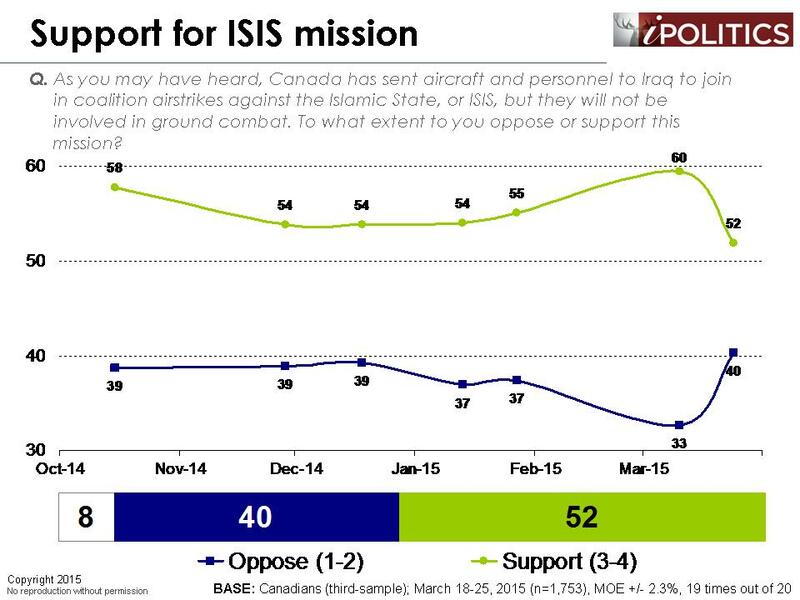 Yet as support for the mission has softened, so has Harper’s rise which is now stalled and arguably falling backward. Given the more precarious nature of support for extension, it is unlikely that this extension will provide much fuel to Mr. Harper’s aspirations for another mandate in October – quite possibly it will be a brake rather than a boon by then. 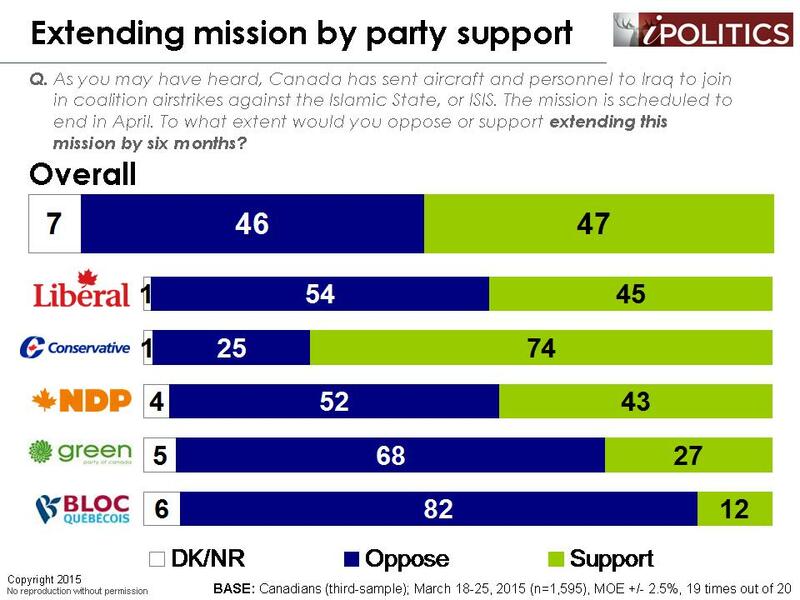 Thomas Mulcair’s NDP has been resurrected into a newly competitive position with a clear upward pattern quite plausibly linked to clear opposition to the mission and its extension (opposition to C-51 may also have been a factor here). Justin Trudeau has seen erosion of his position since the start of this mission, but his clear denouncement of extension may see him ending up on the right side of public judgement as this debate matures. The field dates for this survey are March 18-25, 2015. In total, a random sample of 4,942 Canadian adults aged 18 and over responded to the survey. The margin of error associated with the total sample is +/-1.4 percentage points, 19 times out of 20.